"The Precious Talent of Hebei 河北瑰杰 (hé běi guī jié)"
You know how some people's lives serve as a reminder to others not to make that same mistake? Tian Feng is one of those unfortunate people. Undoubtedly a brilliant advisor to Yuan shao 袁绍, Tian Feng presented many astute plans to his lord. Even Cao Cao 曹操 praised Tian Feng for his abilities. Xun Yu 荀彧 went so far as to call Tian Feng "Bold but treacherous". But why did I say that Tian Feng's life is a lesson for us? Tian Feng's biggest mistake was to choose the wrong leader to follow. Yuan Shao was an indecisive leader and he rarely knew which advice was good, and which was plain suicide. Yuan shao chose not to listen to Tian Feng, and even imprisoned him. The foolish Yuan Shao eventually led his army to defeat in the Battle of Guandu. During the retreat of Yuan Shao, Pang Ji 逢纪 accused Tian Feng of “looking happy to hear the defeat of Yuan Shao”. Yuan Shao was enraged and sentenced Tian Feng to death. Tian Feng predicted this, and chose to kill himself before the execution. Bottom line... choose your boss wisely. Learn from Tian Feng and don't let his death go in vain! 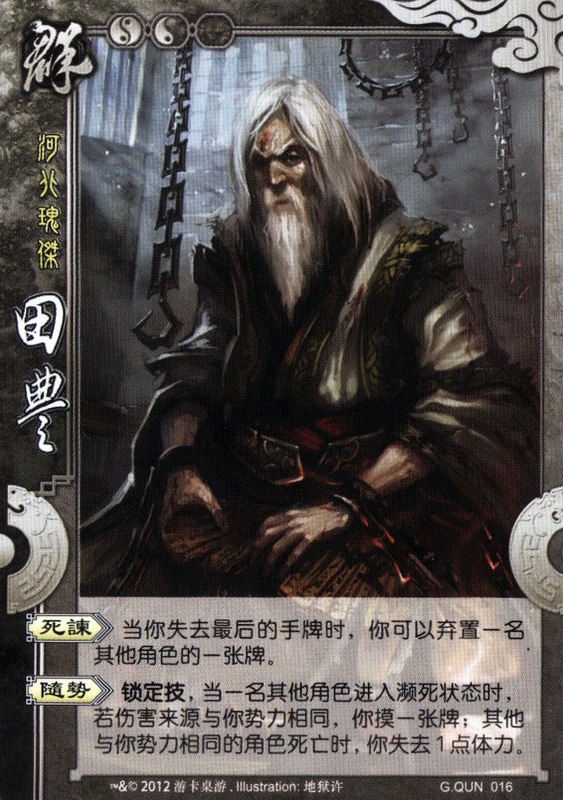 Character ability 1: "Deathly Counsel 死谏 (sǐ jiàn)"
When you lose your last on-hand card, you can discard 1 card from another player. When another player goes into brink of death, if the source of damage that caused it is from the same Kingdom as you are, draw 1 card from the deck. When a player from the same Kingdom as you dies, you lose 1 unit of health. “Deathly Counsel” refers to Tian Feng’s upright actions to admonish his ruler. This ability can be useful against Wei characters (that values cards over health), but to use it is to stake your life, as you need to have no on-hand cards left. “With the Tide” refers to his tragic fate. During his imprisonment, Tian Feng predicted that Yuan Shao would pardon him if the battle was victorious, and kill him if defeated. His prediction was right, as the defeated Yuan Shao sentenced him to death. 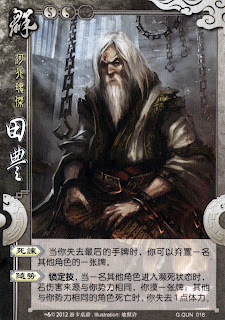 This enforced ability allows Tian Feng to gain power (cards) if his allies win the battle (forcing someone to the Brink of Death), and loses health if his allies are defeated. His ability is quite strong and pair incredibly well when go with Yuan Shao despite the harmful part.